Michael E. Pichichero, MD went to college at Rutgers in New Jersey then the University of Rochester for medical school. He completed specialty training in pediatrics and sub-specialty training in pediatric infectious disease as well as pediatric and adult asthma, allergy, and immunology. He was elected as a Best Doctors in America in 2004, Best Pediatricians in America in 2003, Top Physicians in America in 2004, and Patients Choice Award in 2009. He has been re-elected every year since then to all four groups. 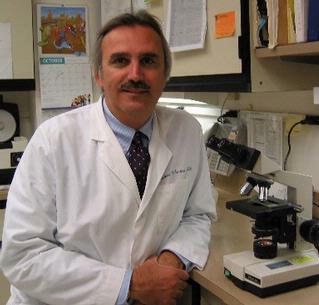 Dr. Pichichero and his colleagues' vaccine studies helped define the key variables that determine immunogenicity of the Haemophilus influenzae b (Hib) conjugate vaccines in the young infant. Encouraging findings have been made with Streptococcus pneumoniae capsular polysaccharide vaccines of several serotypes employing the conjugate vaccine technology. Continuation of these studies should further define structural factors governing immunogenicity of conjugate vaccines, analyze the role of epitopes of the carrier component, and pursue structure-immunogenicity relationships in conjugates of specific pneumococcal serotypes. Combination vaccines are a necessity for the future of human vaccine development. The immunogenicity of acellular pertussis (DTaP) vaccines combined with various Hib conjugate vaccines, Hepatitis B vaccine, and inactivated poliovirus vaccine results in reduced immunogenicity for some of the included antigens. The mechanism(s) and biological relevance of this immunologic interference phenomena is an area of active research in Dr. Pichichero's lab. Bacteria resistant to standard antibiotic therapy are causing acute otitis media with increasing frequency. New antibiotics are needed to cure these infections and to prevent long-term middle ear disease and associated hearing loss. Dr. Pichichero's group studies the epidemiology, etiology, and optimal treatment of otitis media. Sore throat caused by Group A beta hemolytic streptococci occur with concomitant colonization by organisms that may protect the streptococci through beta lactamase inactivation of penicillin at the site of infection. Dr. Pichichero's group evaluates alternative treatments to decrease the relapse rate of streptococcal infections. Casey JR, Pichichero ME. "Safe use of selected cephalosporins in penicillin-allergic patients: A meta-analysis." Otolaryngol Head Neck Surg. 2007 Mar;136(3):340-7. Publication list, as provided by PubMed. as well as links to the full text of many articles (at journal homepages). Pichichero ME. "Preventing Cervical Cancer: Who should get the HPV vaccine? Latest recommendations from ACIP and others." J Fam Pract 2007; 56(3):197-202. 2007; . Pichichero ME. "Use of selected cephalosporins in penicillin-allergic patients: a paradigm shift." Diagn Microbio Infect Dis 2007;57(3) Suppl 1:S13-S18. 2007; . Zeng M., Pichichero ME. "Protection against anthrax by needle-free mucosal immunization with human anthrax vaccine." Science Direct 2007;25:3588-3594. 2007; .